The How Did We Win?/How Did They Lose Corollary? The corollary goes like this: the Lions. I realize this makes no logical sense. 75 yards and 1:07 to victory. With no timeouts and facing a five-point deficit, Andrew Luck and the Colts had to cover 75 yards with just over a minute left in the game. A field goal was never an option. Luck coolly led the team the length of the field--making plays with both his legs and arms. Play #1: Feeling the rush, Luck takes off, running up the middle for a more than manageable second and one. Play #2: Luck spikes the ball to kill the clock. Make that third and one. Play #3: Luck finds Reggie Wayne for 26 yards. Wayne makes a great catch on a throw threaded between two defenders. First down. Play #4: Luck spikes the ball to kill the clock. Play #5: Eyes downfield and no one open, Luck outruns Ndamukong Suh, moving along the right sideline for a 16-yard gain. Best of all, he gets out of bounds to stop the clock. The ball is now at the Detroit 24. Play #6: Incomplete pass to Donnie Avery; probably best that he didn't catch it. 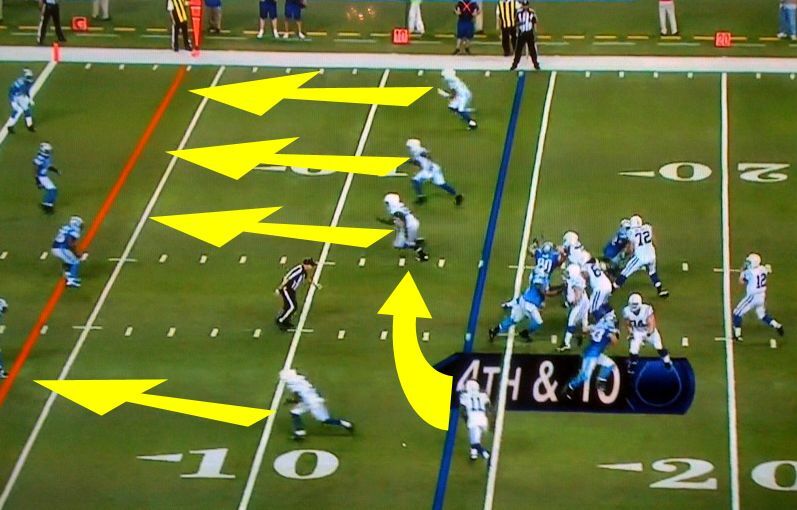 Play #7: The Colts flood the left side line; Luck hits Dwayne Allen underneath for a first down. Allen gets out of bounds to stop the clock at Detroit's 14 yard line. 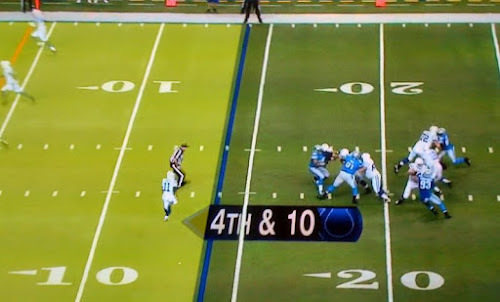 Play #8: Luck finds Reggie Wayne in the back of the end zone, but Don Carey breaks it up. 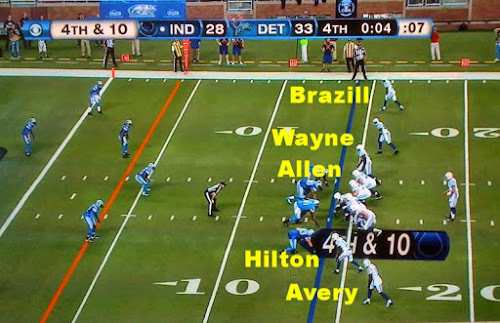 Play #9: Facing pressure, Luck fires the ball to Reggie Wayne, who's double-covered. The play never had a chance and the ball caroms out of bounds. It's now third down on the 14 yard line. The Lions call a timeout, presumably to discuss the most dramatic way to lose the game. Play #10: Luck tries to hit Avery on the right side, but there's little chance for a completion. Fourth down at the 14. Four seconds left. Play #11: Luck takes the snap out of the shotgun and buys some time. He rolls right and finds Donnie Avery, who's running an underneath drag route. No one's in Avery's area code. Touchdown. Game over. Colts win. The Colts come out with Luck in the shotgun with an empty backfield. The receivers are Donnie Avery, T.Y. 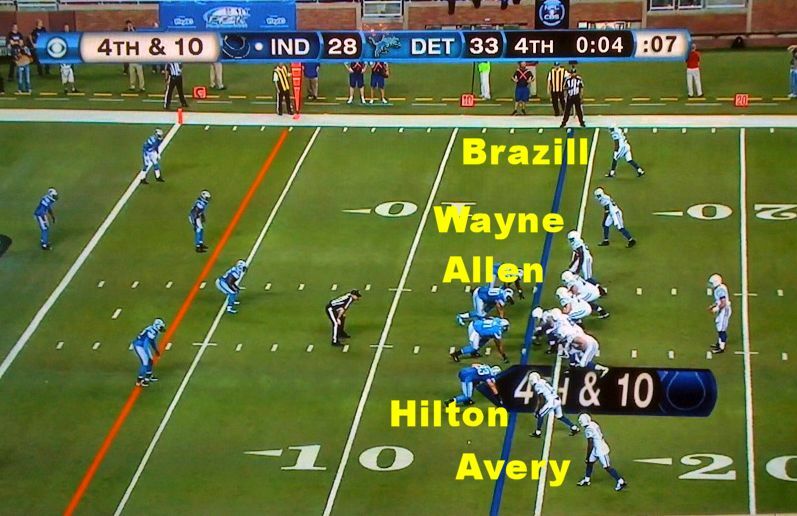 Hilton, Dwayne Allen, Reggie Wayne, and LaVon Brazill (at least I think that's how it goes). Four of the receivers take off for the end zone. Avery, the fifth option on the play, runs a drag route across the formation. The Lions are playing to keep everyone in front of them and loading up the end zone to prevent the ball from getting in. Since the other receivers are going upfield, Avery is immediately left by himself with no one in sight. Luck steps up in the pocket and begins drifting right. His eyes remain downfield. He doesn't like his options and sees Avery running all by himself. Luck flicks the ball to Avery. Again, there's nothing but open field ahead. Avery explodes toward the end zone. By the time the Lions see what's developing, it's too late. Avery is already inside the five. All he has to do is split two defenders. He has a huge running lane. Ball game. Galvatron. Calvin Johnson was unstoppable. Even when the Colts had him covered, they couldn't contain him (think about that one-handed grab against good coverage from Cassius Vaughn). I downgraded Megatron to Galvatron only because the Lions lost. First time for everything. Score an interception for Robert Mathis...the first of his career. 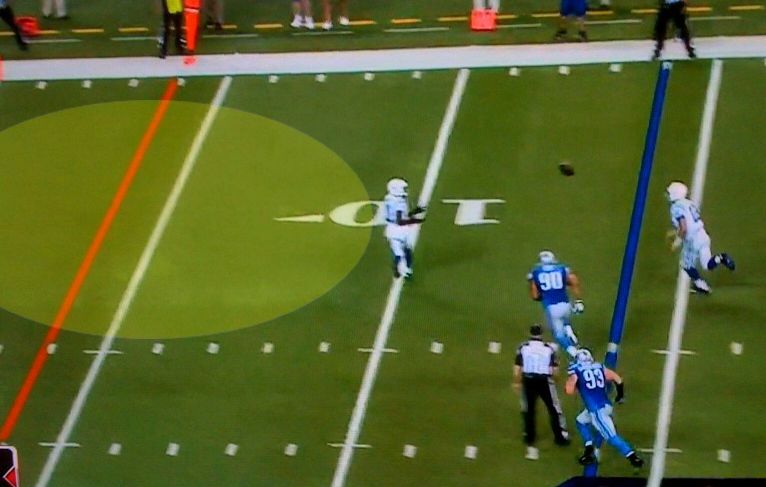 It was a huge interception because Luck had just turned the ball over. This kept the Lions from getting more points. Still more than half full. Luck's completion percentage was 44% for the game. He's definitely a different quarterback on the road. His three interceptions brought his season total to 16 on the year. He's had nine fumbles and lost five of them. Still, the glass is half full because he's winning games and showing big-time poise. Road woes. Even though they've won some games away from Lucas Oil, the Colts haven't exactly been impressive in their wins. It's not just that they're playing close games on the road...it's that they look like a completely different team, racking up turnovers and penalties. If Detroit had any semblance of a defense, this one would've been over early. T.Y. Hilton. This rookie receiver is having a fantastic year, including a 60-yard grab that set up an early touchdown. Donnie Avery. Two touchdown grabs for Avery, including the game winner. When he's healthy, he's explosive. Fleener sighting. Luck found Coby Fleener on a monster touchdown in the first half that covered 26 yards. Fleener didn't do much else...and I mean that. It was Fleener's only catch of the game. The Mayor. A solid performance from Vick Ballard, who found some running room early in the second half. His touchdown run was a nice combination of speed, power, and shiftiness. Settling for field goals. This observation is even more of a no-brainer than the title of Bob Kravitz's column ("Comeback win versus Lions a signature moment for Colts QB Andrew Luck," he boldly proclaims). The Colts defense did just enough on a few drives to keep Detroit from scoring touchdowns. For instance, after an interception from Luck in Colts territory, Indy held Detroit to a 33-yard field goal from Jason Hanson. 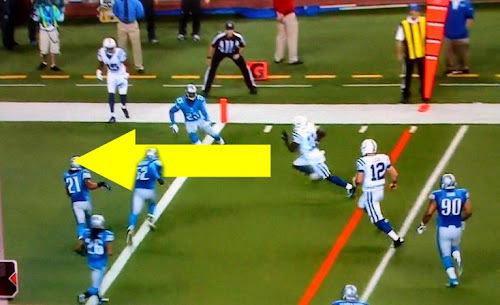 After giving up a 67-yard run to Joique Bell, the Colts also kept the Lions out of the end zone. These stops made the deficit manageable. This will end with a whimper. The Colts went into a second half coma after an impressive drive to open the third quarter. Four punts, three three-and-outs, and an interception followed that score. When the Colts got the ball back with about four minutes left, they trailed by 12 points...things didn't look good. And then...two touchdowns in 2:39. The first one has to boggle your mind if you're a Lions fan. LaVon Brazill gets past the defense when the philosophy has to be "don't let anyone get behind you." Luck evades the rush, shuffles to his left, and then uncorks an on-target throw to Brazill in the end zone for a 42-yard score. 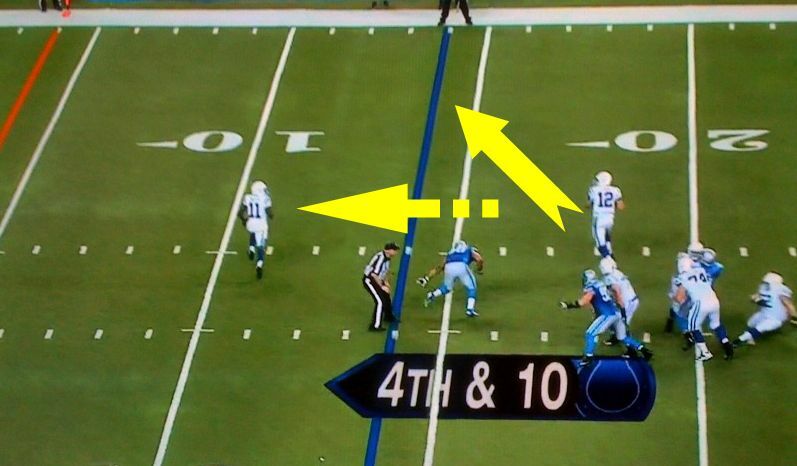 After a defensive stop, the Colts get the ball back...and well...you know. Scoring before the two-minute warning. Another key for the Colts: the touchdown to Brazill came before the two-minute warning, essentially giving the Colts another timeout. 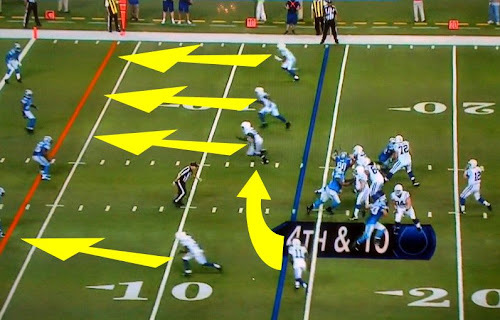 This came in handy after the team gave the Lions a first down on a pass interference penalty. The day Fozzie Bear choked Grover. I didn't hear the broadcast, but my favorite message of the day came from my buddy Nate, who wrote, "You need to listen to Bob Lamey for your blog. He sounds like Grover and Fozzie having a screaming match." My father also said Lamey didn't have his voice. I wish I'd listened. Playoffs?! Are you kidding me, playoffs?! Um...yes...playoffs. Barring an epic collapse, the Colts will make the postseason and finish with a winning record. I...I...really can't believe it.